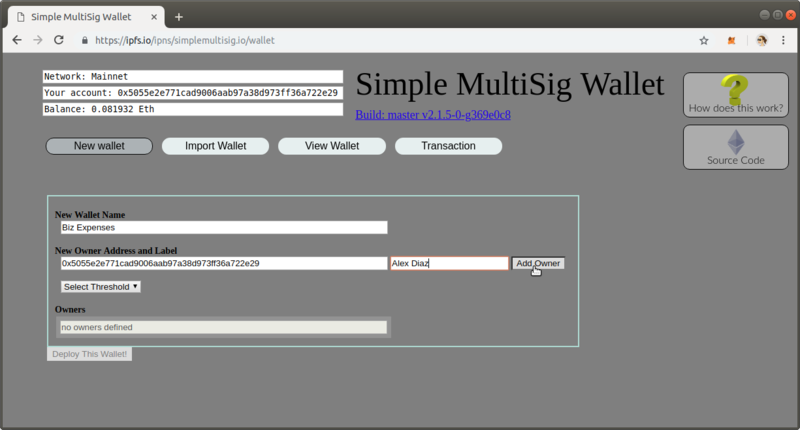 A multi-party transaction is a classic example of something you can do more easily with Ethereum than with fiat currencies. 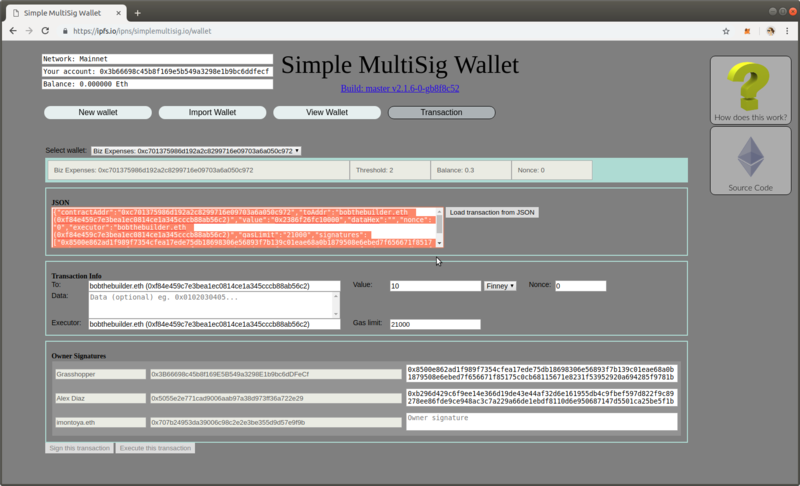 Yet many people don’t realize how easy it is to use MultiSig Wallets for multi-party transactions. The walk through will have lots of screenshots. 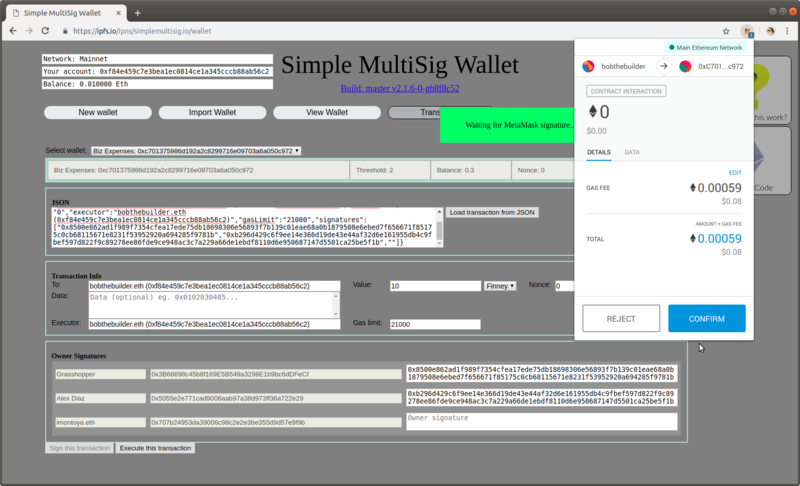 I know that format can be tedious for some people — but if you’re setting up a MutiSig Wallet with large sums of ETH it can be re-assuring to actually see how the screens will look. My two business partners and I each have personal stores of Ether that we own, independent of our business together. We know we’re going to need to sell some to finance our business, but we don’t know how much or when. So we agree that we’ll fund a MultiSig Wallet with 300 ETH and we’ll sell the ETH as needed to pay our business expenses. 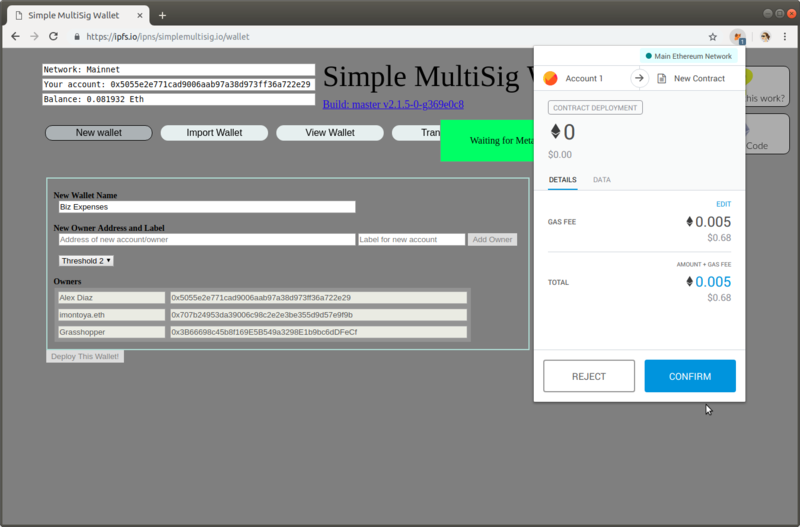 Each of us will deposit 100 from our personal holdings; and any two of us will sign to make a withdrawal from the group wallet. This is akin to the 3 us opening a business bank account that requires at least 2 signatures to write a check or to make a withdrawal. First of all, point your browser at https://ipfs.io/ipns/simplemultisig.io/wallet, and log into MetaMask. 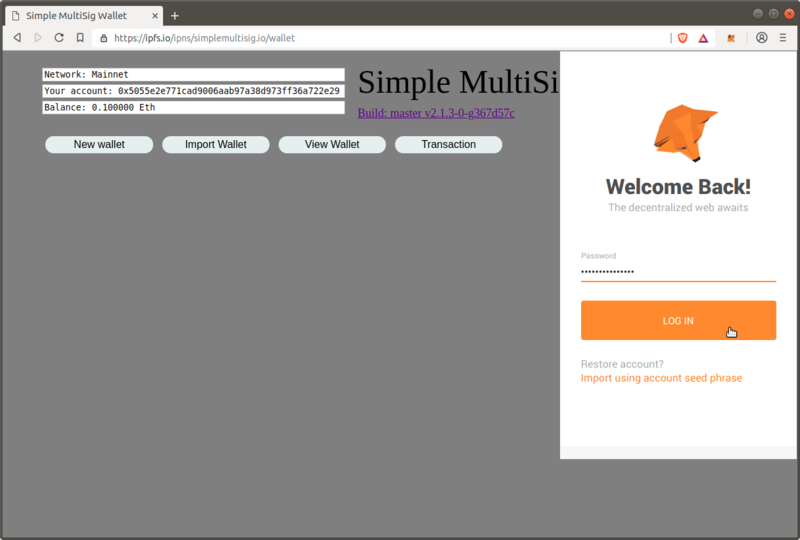 Note that whenever you change MetaMask accounts you’ll need to reload the page. 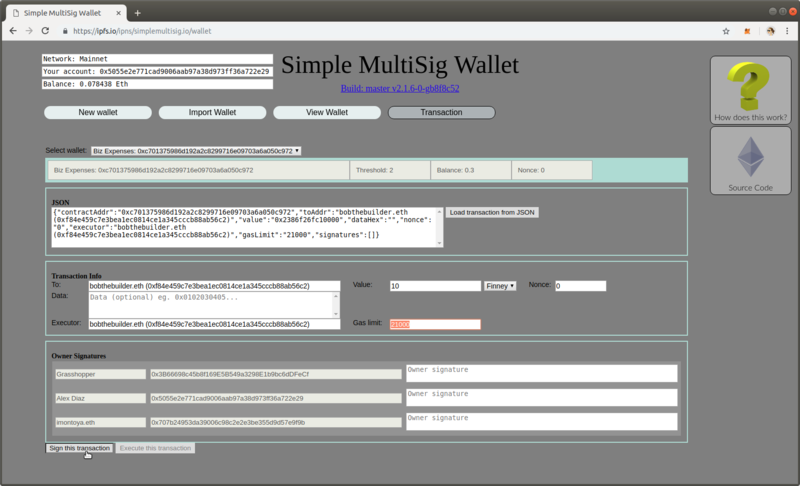 Now I copy the wallet data out of the text-box that says JSON. And I send that by email to each of my partners. 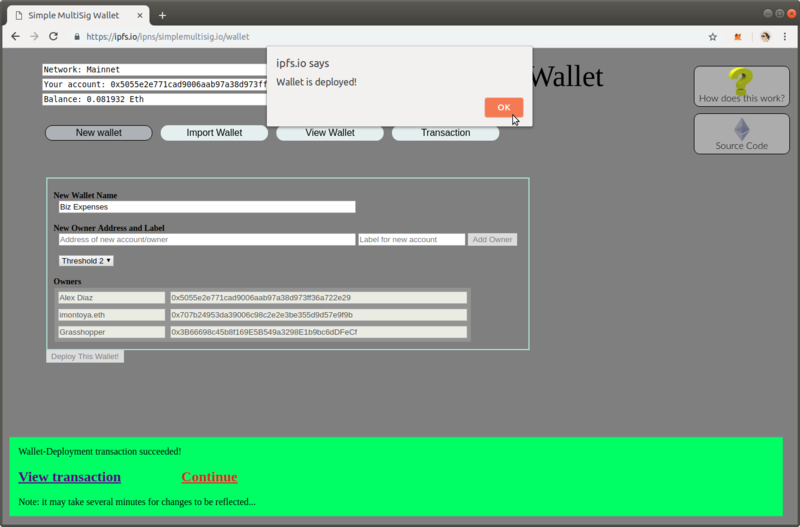 Now, for a moment we’re going to switch to Grasshopper’s computer, where he has clicked on the “Import Wallet” button. My other partner, imontoya will do the same. After I click the “Sign this transaction” button, MetaMask presents me with the EIP-712 signature dialog. 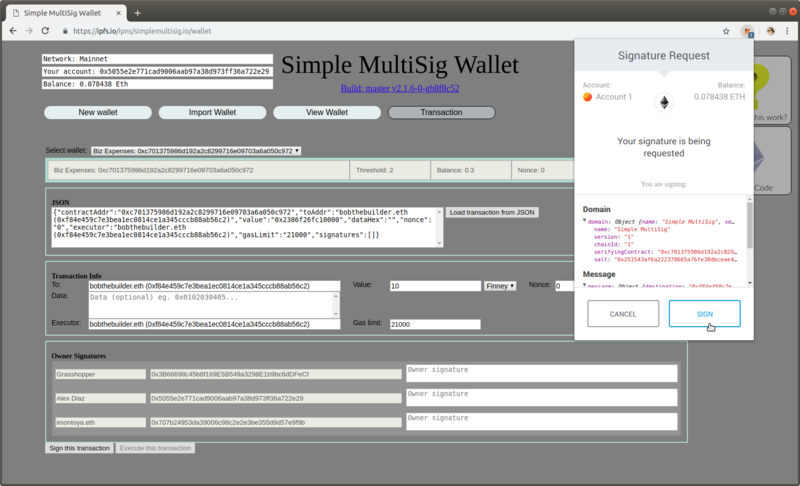 This is one of the new features of this multisig wallet — namely it shows what you are signing. 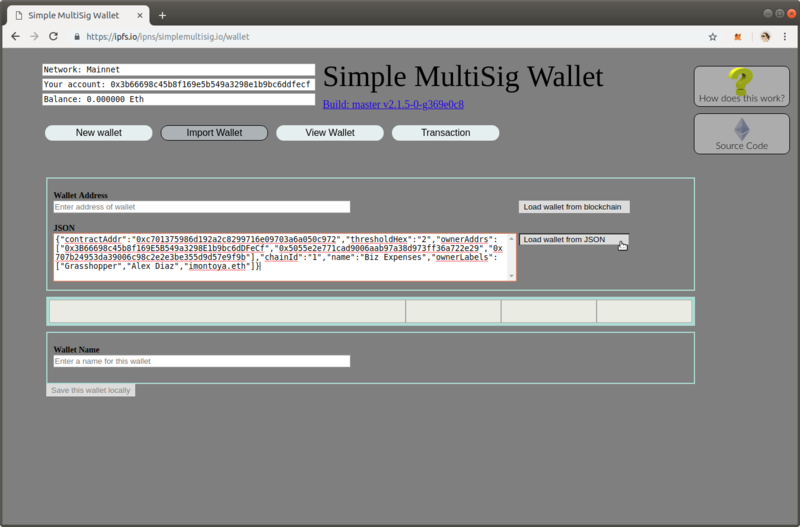 Note that my signature is also included in the JSON that is displayed in the JSON text-box. At this time I copy the JSON from that text-box and send it (by email) to Grasshopper. 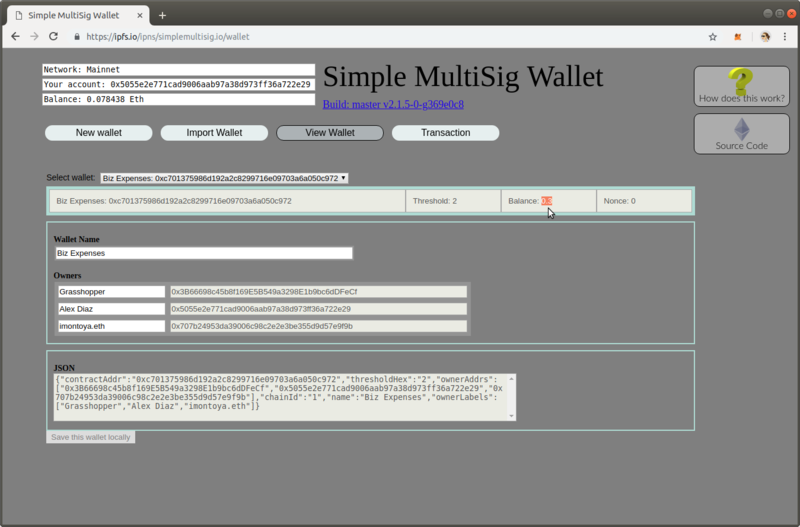 After he verifies that the transaction looks right, he clicks the “Sign this transaction” button and signs the MetaMask dialog (check the MetaMask icon, because the dialog might not pop up) — and now his signature is also added to the JSON. So now Grasshopper copies the new JSON data out of the JSON text box and sends it (by email) to our executor, AKA bobthebuilder. The executor also needs to load the wallet JSON, since transactions only work in their own specific wallet. In the image below the executor has loaded the wallet and also loaded the transaction JSON data that he received from grasshopper, which included two signatures. 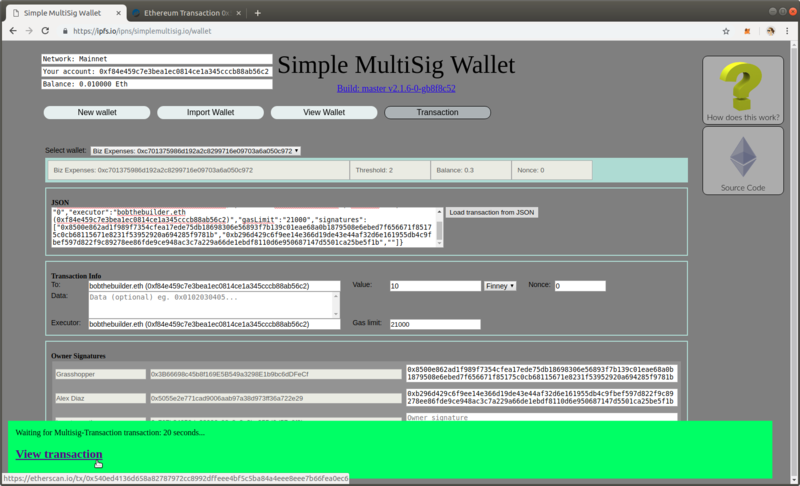 You can see that now the “Execute this transaction” button is enabled. 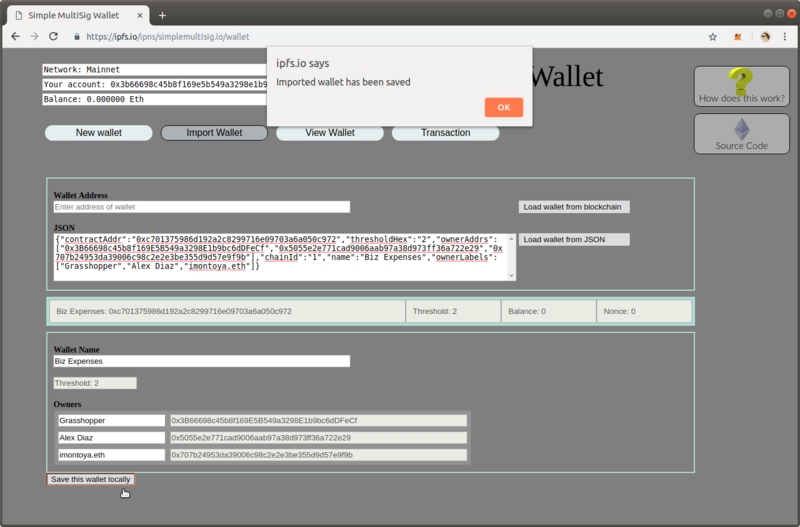 Clicking on the “View this transaction” link opens the etherscan.io page, where (after the transaction is confirmed) you can see that 10 Finney has been transferred to bobthebuilder’s account. 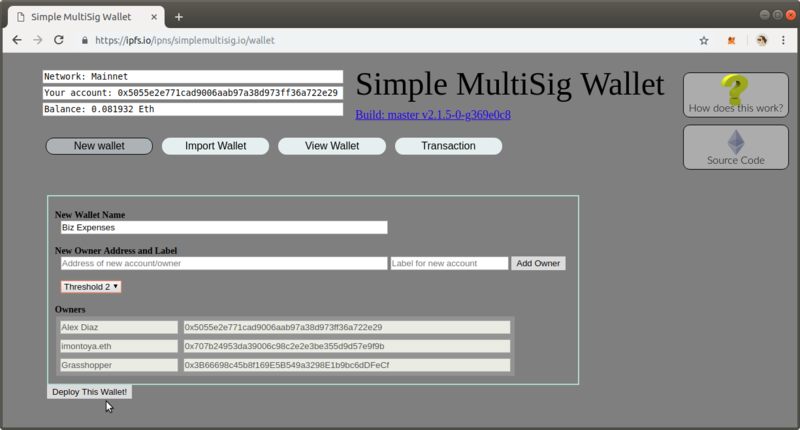 In this article I’ve tried to show almost every step of creating a MultiSig Wallet and sending a typical MultiSig transaction. Thanks to Christian Lundkvist for writing the Simple MultiSig contract; and I’m pretty proud of the User Interface, which I added.